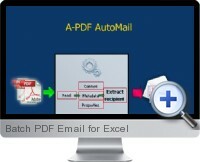 Batch PDF Email for Excel reads contact information from an Excel spreadsheet and sends PDF files as attachments to each recipient. The Excel data can contain detailed information for each personalized email including email address, first name, last name, CC and BCC. Furthermore, the email subject and body texts can be customized with information from the Excel data using place holders. Save valuable time by batch sending multiple personalized emails with PDF document attachments from Excel customer or distribution lists. Watermark the outgoing PDF documents with text and images or use an Excel data field to dynamically create the watermark. Use an existing email application such as Outlook or a SMTP compatible email server to send batch emails. Optionally secure outgoing PDF documents with Document Open or User Permission passwords to restrict editing, printing and content extraction. Batch PDF Email for Excel records the date, time, file name, and all recipients for each outgoing e-mail.